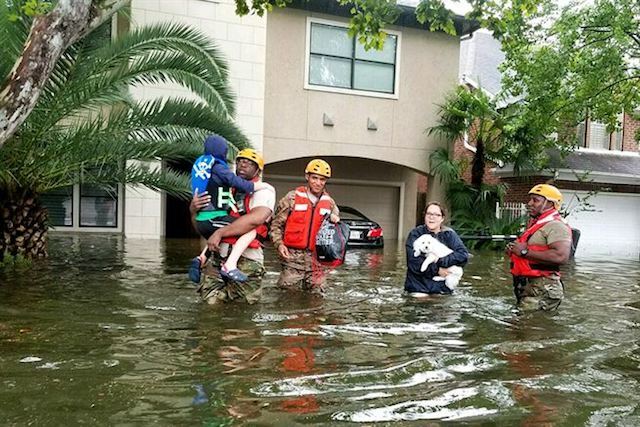 Want to Help Hurricane Harvey & Irma Victims? Try this for Free from your Living Room. This is one of many ways to support those affected by Hurricane Harvey and Hurricane Irma. The “Maharishi Effect” is a scientifically-known phenomenon proving the positive effects that concentrated group meditation can have on an area in need. This meditation guides us into our own healing energy so that we may send it to the victims of this natural disaster. Together, we will cultivate a sense of peace and security within ourselves—and then extend and radiate that out to those in need. I’d like to offer a guided breathing and visualization technique to relieve the victims of the hurricanes happening in our country right now. Just imagine what I suggest—it’s okay if the images don’t look “perfect” in your mind. The most important part here is our intention to send healing energy; it will be felt in the hearts of those that need it. For those unable to listen to this meditation, I suggest reading through the instructions below and then doing your best to recall the main points in your own practice. Find a comfortable position where you won’t be disturbed, and then close your eyes. Begin by taking a few deep, cleansing breaths. If you’ve been watching the news, you may have felt fear and anxiety—we’re going to release all of that tension now. As you breathe in, expand your belly and lungs. As you exhale, let your shoulders fall away from your ears. Take two more just like that. Breathe in to expand, and exhale to soften. Continue to breathe effortlessly in and out through your nose. Then relax the space between your eyebrows and soften your forehead, your jaw line, and the muscles in your neck. Continue to let your breath move fluidly through your body. As you’re resting here, allow yourself to become even more comfortable. Make any last adjustments and then settle into stillness and ease. Imagine there is a beautiful, warm light above you. Then, imagine opening up the top of your head and allowing this light of love to pour through the crown of your head. Let this light exist around you and within you. Allow this light to wash over your scalp, easing the muscles of your face, around your neck, over your shoulders, and down your arms. Imagine this light is caressing your body—erasing any and all tension. The light is not only washing over you, but also radiating from within you. Allow it to move over and through your chest and into your abdomen, relaxing the muscles of your hips and lower back. Feel it, sense it, and see it wash over your legs, knees, shins, calves, ankles, feet, and toes. Feel your feet connected to the surface beneath you and into Mother Earth beyond that. Not only are you drawing this light from above you and cultivating it within you, but you can also call forth the stability and security from the earth beneath you. Allow your body to pull from the grounding energy of Mother Earth. You are feeling grounded from your roots and connected to the light that exists around you, above you, and within you. Allow the light to burn brighter. Focus your energy in the area of your solar plexus and abdomen. Let a beautiful ball of energy begin to brew here. With every breath that you take, every beat of your heart, this light energy begins to pulsate from your solar plexus into your body. Dispersing through your limbs and out through your fingertips and toes. This light, this warmth, is encircling every cell of your being. This light is as beautiful as a ray of sunshine pouring through the leaves and branches of a tree. It is filling every crevice of your being, of your physical body, of your mental space, and your emotional world. Allow this loving light to radiate and pulsate through you—feeling alive, feeling vibrant. Concentrate on moving this energy from your solar plexus into the space around your heart. Feel the gentle and steady beating of your heart. Feel that, in this moment, you are safe. You are at peace. Your body is breathing and doing everything it needs for you right here, right now. You are safe. You are at peace. You have everything you need. It feels so good to rest in this knowingness. To know that here, you are safe and well. You feel held and supported. As you are overflowing with this sense of safety, begin to extend and radiate this energy out from the physical boundaries of the body out to those that you care most about. Allow them to feel safe, secure, and at peace. Imagining that the light that exists within you and around you is pulsating from your heart space now. Invisible waves of energy extend beyond you, touching those you care most about. Imagine them safe, happy, and secure. Feel how good it is to know that those you love are safe, at peace, and secure. Feel it in your heart and in the depths of your belly. Notice the way that it relaxes your body. Now extend this feeling of peace and support from yourself and those that you care most about out to all those who have been affected by Hurricanes Harvey and Irma. Send love and support and peace to those that have lost their homes, their loved ones, and to anyone who has felt afraid, alone, or hungry. Continue to send them your light and love, pulsating and radiating it from the center of your heart. Feel it extending like beautiful rays of light from your being and touching those who have been affected by these hurricanes. Imagine that the love you’re sending now can touch their spirit, and they can now breathe a sigh of relief. They can feel safe again. They can feel at peace. They can reconnect with their faith. They can find a sense of security. Imagine how calm, at ease, and safe you feel right now and extend that feeling, wrapping it around those in Texas and Florida. All those who have been affected and all those that are serving, supporting, and helping. Imagine that your light, your love, and your energy is wrapping around these people, touching them so they can feel even just a moment of relief. So they can breathe easier. Imagine that their bodies are also radiating this light. What may start as a spark can begin to catch flame, and this flame—of empowerment, strength, and community—can burn brightly in the hearts of all those affected. Begin to create this beautiful ball of energy. Surround that entire area so that it can inspire those who can reach out—who can physically help—so that it can bring moments of relief and security. So they can sleep better. So they can fill their bellies with good food, drink pure clean water, and feel dry, safe, and secure. Imagine that entire area filled with this light, love, and support. Intend for this energy to inspire and help people. Neighbors helping neighbors. Communities getting stronger. See it—feel this light burning brighter. Radiating out from your heart and touching all those affected. Letting each person feel this moment of relief. Feeling safety. Feeling security. Letting their bellies be filled with good food, access to clean water, with a roof over their head and dry clothes to wear. Allow them to feel the connection and strength in the community that exists all around them. Allow these communities to become stronger. Take a nice deep breath. Allow your energy to continue to support and love and send peace for as long as you’d like. When you feel complete, draw your energy back into your own heart. Watch it flow back to you. All of the support you’ve extended will remain, but your own personal energy is returning back to you now. Return back into your physical body into your heart space. Take another deep breath and let it go. All of your energy returning to your body; your heart. You feel full. You are full of light, love, and strength. Thank you for being a part of this community that supports one another—that lifts each other up. I encourage you to do this meditation, prayer, or blessing of your own as often as you feel called to. From my heart to yours. Namaste. In 2007, Jennalee Hendricks was struck by divine intervention and her life was forever changed when she discovered the power of the mind-body connection. She became the hypnotherapist and center director for the Chopra Center for Wellbeing. 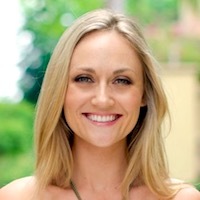 Jennalee has spent the last 10 years in board rooms, classrooms, hospitals, and healing centers teaching and consulting on meditation, hypnotherapy, and Ayurveda. Now her work is primarily shared online for the global community and once a month under the full moon with cosmically inspired meditations at Glowga events (yoga with glow sticks). Catch up with Jennalee on her YouTube channel.